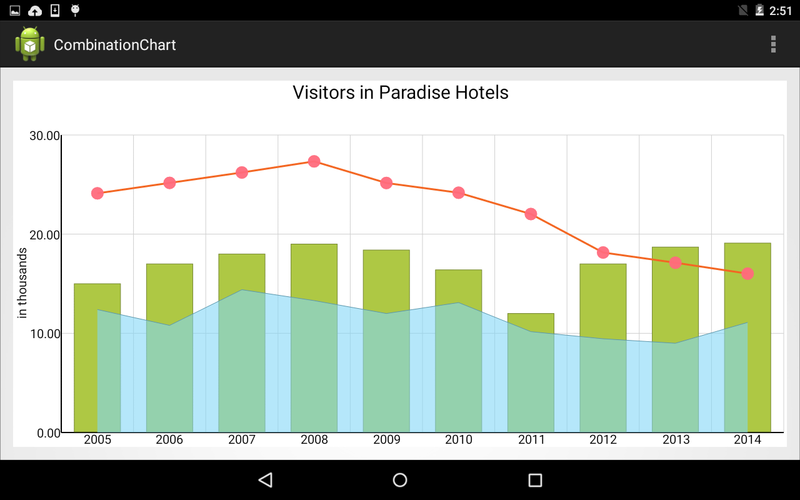 This post is a step-by-step tutorial in how to create a combination chart in android with the Charting for Android library. Let’s create a new project. 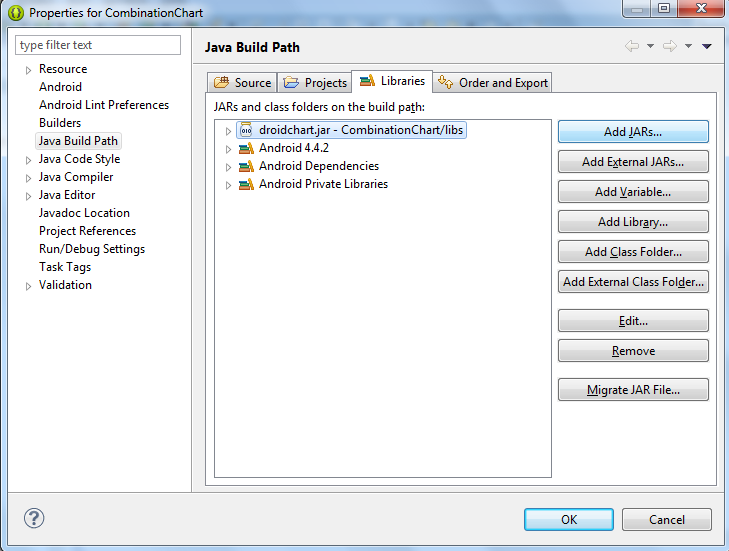 In Eclipse, we choose File -> New -> Android Application Project. We write “CombinationChart” as an application name. The package is called com.mindfusion.combinationchart. The other settings remain unchanged. II. Adding the jar file. With project created, it’s time to add the libraries. Copy the droidchart.jar from the libs directory of the sample project (download file here) to the libs directory of your project. Then right-click on your project and choose Properties -> Java Build Path -> Libraries -> Add JARs. Navigate to the libs folder and add the droidchart.jar. Time to declare the chart in the layout of the application. We build a simple application, where the chart will be the only thing that shows. So, we edit the activity_main.xml file, which is found in res -> layout folder in the project tree for the CombinationChart application. We change the layout to Linear and we introduce a new xml node – chart. The chart node refers to a class found in the com.mindfusion.charting namespace. We name it combi_chart. 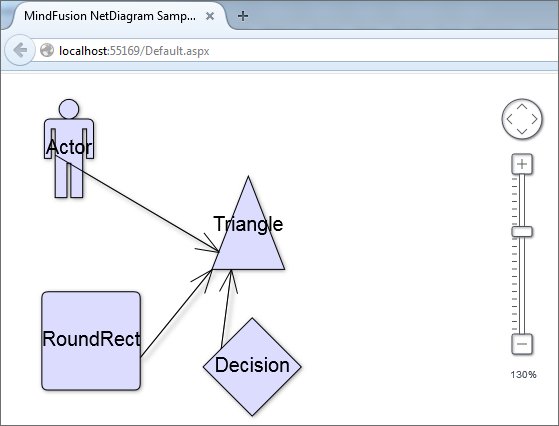 This is important because we’ll use the name to retrieve the chart object in the next step. In this step we’ll set the general chart settings. First, we get the chart object, which is declared in the layour (see previous step). Then we set the title and the offset of the title e.g. the space between the title and the plot are for the chart. We also set the height of the font for the title labels and the other labels at the chart. Let’s not forget to add the ready series to the collection of series. VIII. The line series with scatters. The ScatterFillColors and ScatterStrokeColors are used for setting the colors of the scatters. The properties for the line are the same as with the bar series: StrokeColors. The area series has a different line type than the scatter series. We don’t set the scatter type here since its set to “None” by default. The data in both line series is set in the same way as in the bar series and we don’t cite it again. An elegant combination chart for Android mobile devices. Read more about MindFusion Charting for Android library here. You can now use custom formatting for numeric labels for all chart types. The formatting is applied when you set the format of the label to NumberFormat.Custom. The properties that set the custom number format use the .net custom format strings. MindFusion WinFormsCharting control offers you greatly improved sorting of bar values in a bar chart. 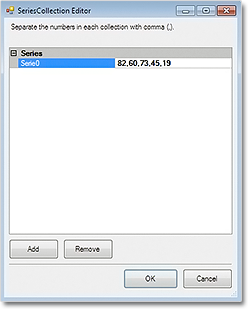 You can use the SortOrder property to sort the bars in each series or cluster in ascending or descending order. You can also sort each series/cluster with the SortSeriesBy property. You can preserve the color of each bar when sorted if you set the SortColor property to true. 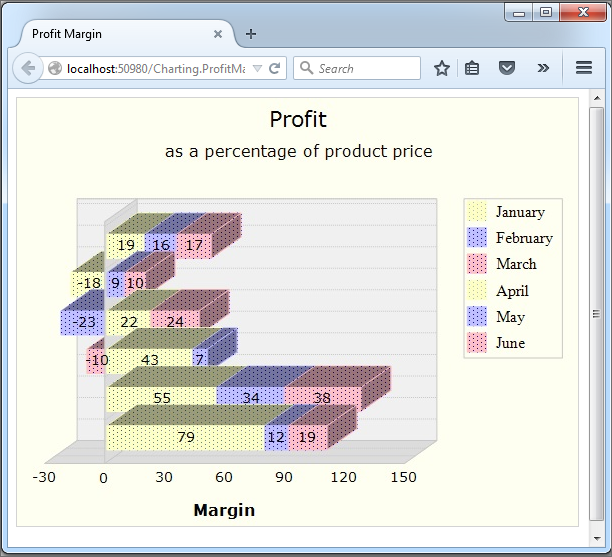 A WinForms chart with sorted bars. 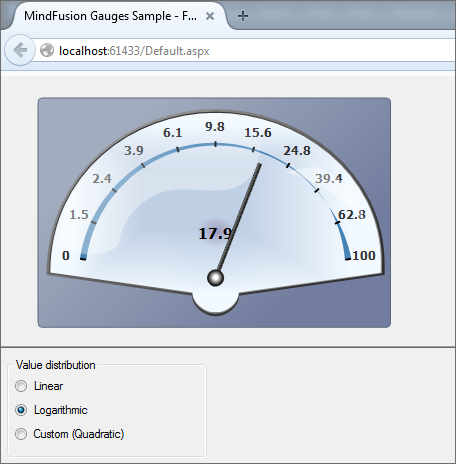 MindFusion no longer provides separate trial and licensed versions of its components. Instead, you should set the LicenseKey property to disable the component’s evaluation mode and stop displaying trial messages. If your application has more than one Diagram instance or other controls by MindFusion, a single call to MindFusion.Licensing.LicenseManager.AddLicense(key) is enough to specify the key for all the controls. You can find your license key strings listed on the Keys & Downloads page at your http://clientsarea.eu account. SortYData and SortXData properties added to line charts. Technical support is available at the forum, help desk or at e-mail support@mindfusion.eu. All inquiries are answered within hours of being received. About MindFusion.Charting for WinForms: a professional programming component for WinForms, which lets you create remarkable charts fast and easy. The tool supports all major chart types – line, pie, radar and bar – and numerous variations of them – column, area, bubble, polar, doughnut etc. 3D charts are supported as well. Charting for WinForms supports a rich user interaction model with features like zoom, hit testing, drill down, mouse dragging and more. You can use delegates to present mathematical functions, undefined values are also acceptable. Values can be data arrays or retrieved through a database. The appearance of each chart is fully customizable. The control offers strong design-time support with custom collection editors and chart wizards. At your disposal is a set of predefined appearance themes and a theme editor tool. A full list of the features can be read here. member of a team. We use MindFusion.Charting for WinForms component. 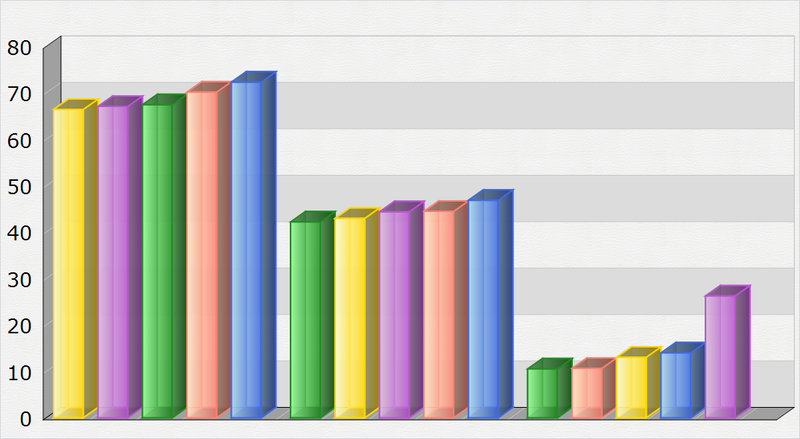 A 3D chart would look more sophisticated so we choose “Single3D” for a BarType. We set the ResizeType to “Scrollable“. This way we can scroll to see all data on the chart without the need to increase the size of the chart and let it take too much space. In this post we discuss how to create a drill down chart with the MindFusion.Charting for WPF tool. Our main chart will be a pie chart, where each peace shows some aggregate data. 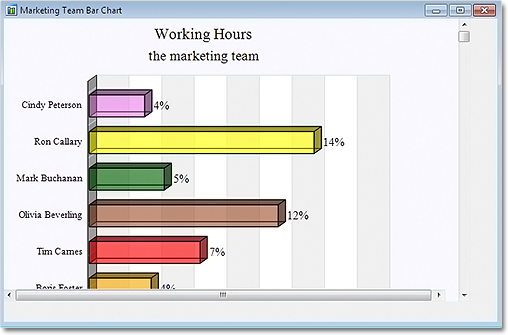 When clicked, a new chart pops up – a bar chart, which shows details about the clicked piece. my:PieSeries OuterLabelOffset="30" OuterLabelPath="CorporationName" OuterLabelType="CustomText" DataPath="Sum" InnerLabelType="Percents" Name="pieSeries1" DetachedPiecesList="20"
The Sum property, which we mentioned above, provides data for the chart. The brushes are set with the brush editor in the property grid. We use the charting component’s HitTest method to detect when a piece was clicked and to show a bar chart with the respective data. PiePiece.PieceIndex gives us the index of the clicked piece. We use the Control.MouseDown event to detect mouse clicks. The HitTest method returns a collection of ChartElement objects. In our case we don’t have several ChartElements that overlap each other and might be clicked simultaneously, that’s why we take the first ChartElement. The data for the bar chart comes from the list of the expenses, which is a DoubleCollection. 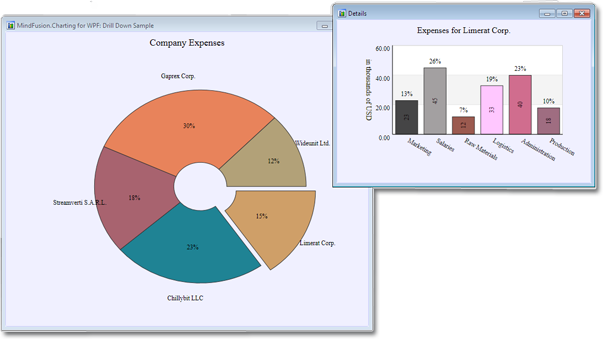 The main pie chart with the bar chart that shows details for the clicked pie piece.